Presented at CAWC 2017. Proceedings of the Annual Canadian Association of Wound Care Conference; 2017 Nov 16-19, Mississauga, ON, Canada. Current gold standard technique for tissue management in DFUs is regular sharp debridement to reduce bioburden, as this optimizes effectiveness of antimicrobials and stimulates wound healing.1 However, the extent of debridement required to reduce bioburden based on visual inspection is unclear. Fluorescence imaging has recently been used to detect bacterial fluorescence in wounds in real-time at the bedside.2 This study reports its use assessing pre-and post-debridement bioburden to specifically target secondary/additional debridement to regions of bacterial burden. Fluorescence imaging was incorporated into 22 routine wound assessments (12 DFUs). Initial curettage debridement was performed using current best practices without fluorescence guidance. Fluorescence images acquired after initial debridement were used to target remaining regions of bioburden. Bacterial (red) fluorescence was observed in 50% of DFUs (11/22) prior to any cleaning or debridement. DFUs obscured with heavy calluses were noticeably less likely to exhibit red fluorescence. 20/22 DFUs were debrided as part of routine wound care. 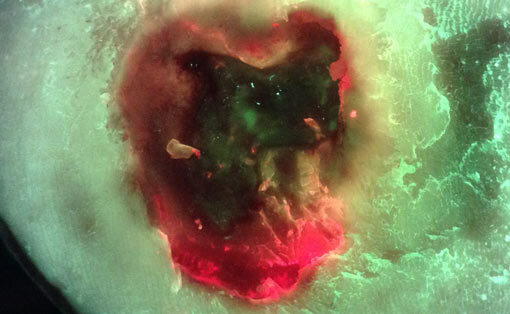 Fluorescence images obtained after initial debridement revealed persistent red fluorescence in all 20 debrided DFUs (100%), indicating incomplete removal of bioburden. Based on these images, additional, fluorescence-guided curettage debridement, targeted specifically to regions of fluorescing bioburden, was performed in 85% of these wounds. Bacterial fluorescence lessened with additional, targeted debridement in each case. Results suggest that current best debridement practices of visual inspection and clinician judgement (1) do not maximize removal of bioburden, (2) leave behind an unacceptably high bacterial load (≥ 104 CFU/g)3 that is considered detrimental to wound healing4, and (3) fail to optimally prepare the wound for antimicrobial dressings/treatments. 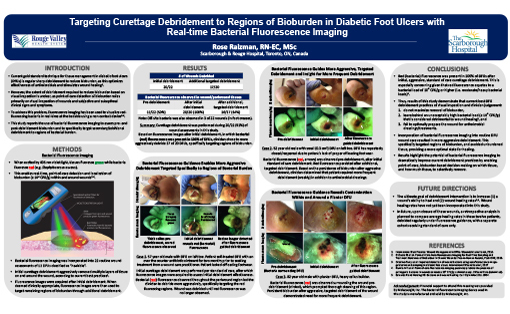 Incorporation of bacterial fluorescence imaging into routine DFU wound care resulted in more aggressive debridement. This specifically targeted regions of bioburden, and avoided unburdened tissue, providing a more optimal state for healing. Results highlight the potential of bacterial fluorescence imaging to dramatically improve current debridement practices by enabling point-of-care, bioburden based decision making on which tissue, and how much tissue, to selectively remove. Edwards R and Harding KG, Curr Opin Infect Dis, 2004.